Pork chops, shrimp, chicken breast—all are good stuffed. But stuffing a piece of meat is awkward at best: You cut a big pocket and fill it. Then, as it cooks, the filling leaks out. Unless, that is, it’s trussed with enough toothpicks to resemble an agitated porcupine! Well, there is a better way. The technique here makes stuffing a breeze. Classic cordon bleu (“blue ribbon” in French) is veal or chicken layered with ham and Swiss cheese. To make sure the cheese doesn’t ooze out during grilling, cut the chicken breasts as shown, then wrap the cheese in ham before stuffing the chicken. These steps will keep the cheese on your plate, not the grill grates! Cut a pocket into each breast by first inserting a knife blade into the wide end. Next, sweep the blade back and forth, carefully cutting the opening larger, being careful not to cut through the end, top, or bottom. Wrap a slice of ham around each block of cheese and insert into the pockets. Coat each breast with Dijon, season with salt and pepper, and grill 5 minutes per side. Whisk vinegar, 1 T. Dijon, and honey together in a bowl. Drizzle in oil, whisking until emulsified, then add thyme and salt and pepper to taste. 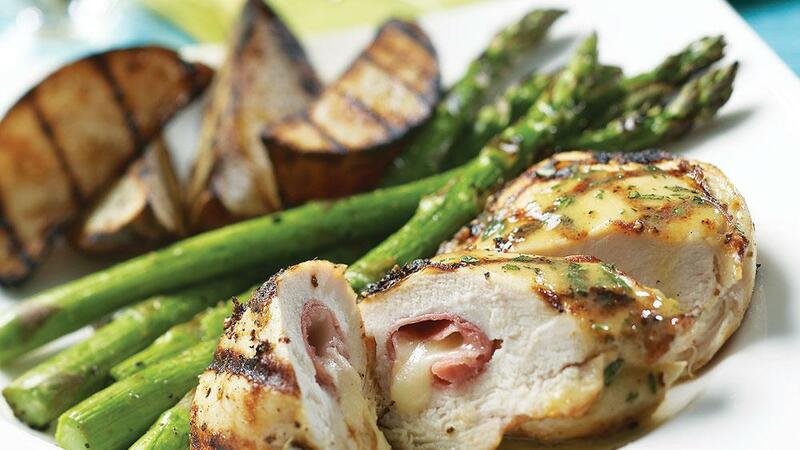 To serve, drizzle vinaigrette over chicken and asparagus. Sweep the knife blade back and forth to enlarge the pocket in the chicken breast. When preparing the cheese, keep the blocks small—about 3" long and 1/2" wide. Wrap each in ham. Stuff chicken with cheese blocks. Be sure cheese is enclosed inside the chicken so it doesn’t melt out. 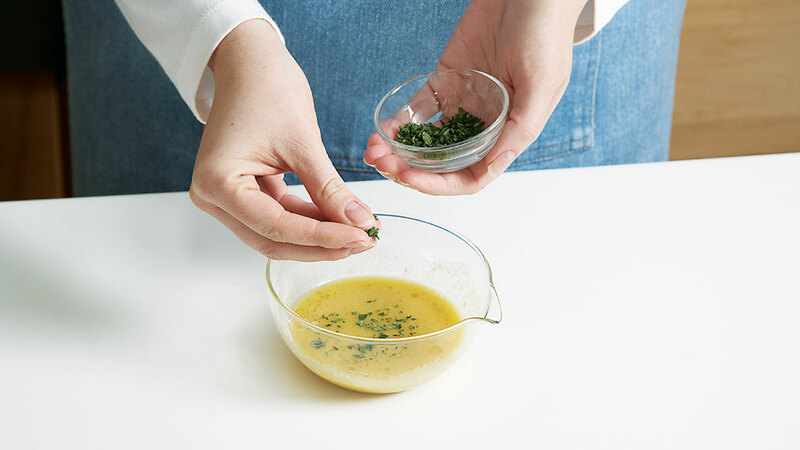 Whisk the vinaigrette together while chicken cooks. Fresh thyme gives it a bright, fresh flavor.